GSM Guard allows you to control remote sites and objects equipped with security alarms, controllers, or surveillance systems that send alerts about specific events or issues via GSM, SMS, or GPRS. 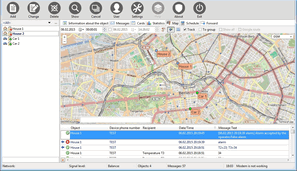 When installed on a server, GSM Guard receives and saves all incoming messages. If necessary, it can notify an administrator, operator, or business owner by various means. The application can monitor both stationary and mobile objects. All-in-one solution. It can work with any security or surveillance system, as well as with any GPS/GLONASS trackers. Alert options. It allows you to receive alerts by various means: GSM (voice or DTMF), SMS (in any language, including text messages via SMPP gateways), or GPRS (TCP or UDP). Flexibility. You can configure any format for SMS text messages received from monitored objects. GSM modems. GSM Guard can simultaneously handle multiple modems. Among other things, it supports state-of-the-art USB GSM modems provided by cellular carriers. Logging of all operations. GSM Guard displays warning messages with comprehensive information about the object and the event. Accessibility checking. GSM Guard provides flexible means to check the accessibility of each object. Event processing. It is possible to analyze received data and process events, for instance, send e-mail messages when a certain value exceeds some predefined limit; Alerts. The administrator's workstation can receive alerts about each event. Control. You can control a system at the monitored site via GSM and respond to events by sending SMS or DTMF commands. Interfacing with external security systems. GSM Guard supports the Ademco 685 and Sur-Gard protocols, so it can receive and post-process messages from special-purpose security alarm systems. Remote access. GSM Guard's built-in web server allows users to access its data via the Internet from any device (including the iPhone, the iPad, Android-based smartphones, etc.). GSM Guard Copyright ©1999-2014 AGG Software. All Rights Reserved SOFTWARE LICENSE Trial Limited Version The trial limited version of this software may be used for evaluation purposes at the user's own risk for a trial period. At the end of the trial period, the user must either purchase a license to continue using the software, or remove it from his/her system.